breed, was born. Huddersfield Ben was owned by M.A. Foster, and he enjoyed a very public life, to popularize the breed in England. He demonstrated that he was very successful in the rat killing contests (these were quite popular in the 19th century), and he won more than 70 prizes as a show dog as well. Yorkshire Terrier up until the 1930’s usually weighed approximately 30 pounds, not the 3 to 7 pounds it does today. weighed on average between 12 and 14 pounds. Now the Yorkie that is shown in conformation, weighs between 3 and 10 pounds. One of the characteristics of the Yorkie that causes it to end up being abandoned by an owner is the amount of time that must be spent grooming this dog. It is very high maintenance. So if you are not committed to at least one half hour of grooming per day, this breed of dog probably should not be on your list of desires. 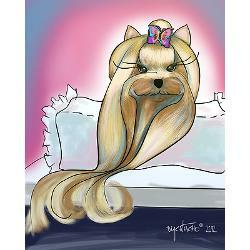 This is assuming you take your Yorkie on a regular basis to a grooming shop to have its coat trimmed and shaped. Yorkie's getting hurt or killed. The Yorkie tends towards aggression when around, near or in the general area, of another dog it doesn't know. It doesn't matter to the Yorkie the size of the dog it is taking on. It could be a Doberman, St.
it plays in must be fenced and protected from stray animals getting inside. 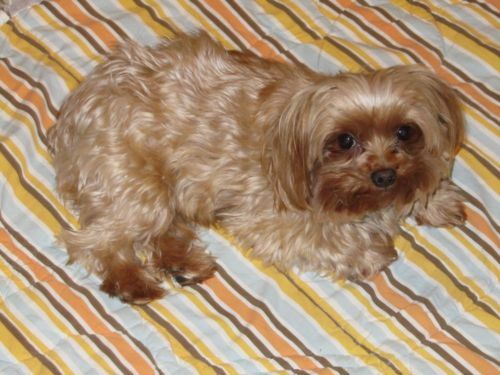 The Yorkie is very alert, his dark eyes fairly sparkle with the intelligence this breed possesses. It is a very loyal and depending how it is trained and the environment it lives in, will have a very sweet disposition. When trained with consistency and firmness, the Yorkie is a very quick learner. Yorkies in conformation show coat rarely compete in obedience or agility due to the problems of grooming - but if you are not into conformation, Yorkies are tremendous candidates for the performance events due to this high degree of intelligence. Loyal and territorial, the Yorkshire Terrier makes a good watch dog and a welcome companion. 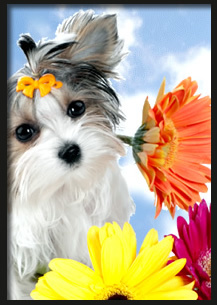 Family and friends love congenial personality, but the Yorkie may not appreciate small children. problems you may encounter with a Yorkshire Terrier. Yorkies should always be dried after becoming wet and may want a sweater or coat both inside and outside. manner should give the appearance of vigor and self-importance. small, V-shaped, carried erect and set not too far apart or may flop. Yorkshire terrier is born with floppy ears. They do not have the proper muscle strength at the base of the ear in order to hold them erect. These muscles will grow and become stronger with time (in most cases). Usually between the age of 3 months to 6 months, the ears will gradually raise up and the stand on their own. One may stand up before the other...typically the other is not far behind and both will match up soon. Some Yorkie puppies are "late bloomers" and the ears may not stand up until much later. in some instances, the ears may not stand up at all. Those with ears who do not stand erect, as referred to as having Floppy Ears. The only time that this would matter, is in dog show conformance events, such as the AKC events, in which judges are looking for ears that are balanced, V-shaped and standing straight up. Therefore, while it will be a huge fault in show, pet owners should not be too concerned....as it is just something that does happen now and then...it does not affect health...And it can be looked at by many to be an endearing feature that makes the Yorkie look younger than they are. What Can I do to make a Yorkie's Ears Stand Up? Shaving the hair. The top 1/3 of upper ear is shaved to minimize the weight on the ears. This method involves shaving both the inside and outside of the dog's ear; usually done with a clipping machine which should not cut the dog's skin. What is Yorkie Ear Taping & Does it Work? This method is not 100% guaranteed to work; however it does work in some cases. One should stop using this method if it becomes obvious that is causing discomfort. Itching, etc. Begin by shaving the ears, as mentioned above. Clean the ears, using a canine cleaning solution and a Q-Tip. Be sure to not enter too deeply into the canal, as doing so could cause damage. Gently fold the ear, as if you were closing it up vertically (up and down). When folded, the ear will be standing straight up with a point at the very top. Wrap gauze around the base and then secure that with bandage tape or scotch tape. Once both are done, use tape to hold both in alignment with each other. You may need to experiment to find the perfect degree of tightness. Too tight and circulation will be cut off. Too loose and the wrapping will fall right off. When done correctly, the ears will be standing straight on the Yorkie and not flopping to the side of the head. You will want to leave the taping on for 3 days at a time and then allow the ear to relax and receive fresh air. Be sure to groom and clean the ears in between tapings. Allowing this small break time will not interfere with the overall process. Some respond to this within the 3 days, others may take 3 weeks. Ultimately, it will be genetics that are the deciding feature...You can help to push them along, but Mother Nature has the last say. You may find that this seems to give temporary results. If so, only re-tape if an ear or both ears begins to flop down. If you do not see results within a month, it is recommended to accept that your Yorkie is either a late bloomer or will have floppy ears. If the ears are not standing up by the age of 7 months, it is most likely not going to happen. Most muscle development is done by this time. There are plenty of adorable purebred Yorkshire Terriers who do not have erect ears...Even though conformation desires this; it is just fine and nothing to worry about if you are not planning on showing your dog. the back line level, with height at shoulder the same as at the rump. viewed from the sides. Feet are round with black toenails. the level of the back. tail. Hair on tail is a darker blue, especially at end of tail. down on back of neck. forelegs nor above the stifle on the hind legs. Should not exceed 10 pounds. black hair intermingled with any of the tan. 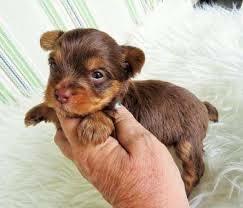 Now Yorkshire terriers are coming in many colors. Parti colored Yorkshire Terriers are extremely rare, but the parti gene has actually been in the Yorkshire Terrier breed since the 1800’s. Parti Yorkshire Terriers look like traditional yorkies except for their unique coloring. Their color is predominately white with black and tan markings. These gorgeous dogs have been eligible for AKC registration since 2000. Parti colored Yorkies are healthy animals and they are not a genetic freak of nature as some people, groups, or websites suggest. They are beautiful dogs and some of the finest examples of this magnificent breed. The Parti gene is a recessive gene, and can only be expressed if a parti gene carrier is bred to another parti gene carrier. A parti gene carrier actually looks like a standard Yorkshire Terrier except they may have white markings on their chin, chest and/or feet. The chances of having full parti yorkies in a litter depends the initial breeding situation. ancestry of sound healthy animals. believed that the tendency to develop this condition is hereditary. diseases, bellow is a list of these. their size, however mixture yorikes may not live as long. to their in dependant nature, which is a characteristic within most yorkies. trained, for example some yorkies bark at strangers, whilst others get excited. usually do not show aggression to humans. don't be afraid to feed them bones, to replenish calcium. without a family history of eye disease. diet consisting of dog biscuits and fresh chicken would be an adequate choice. 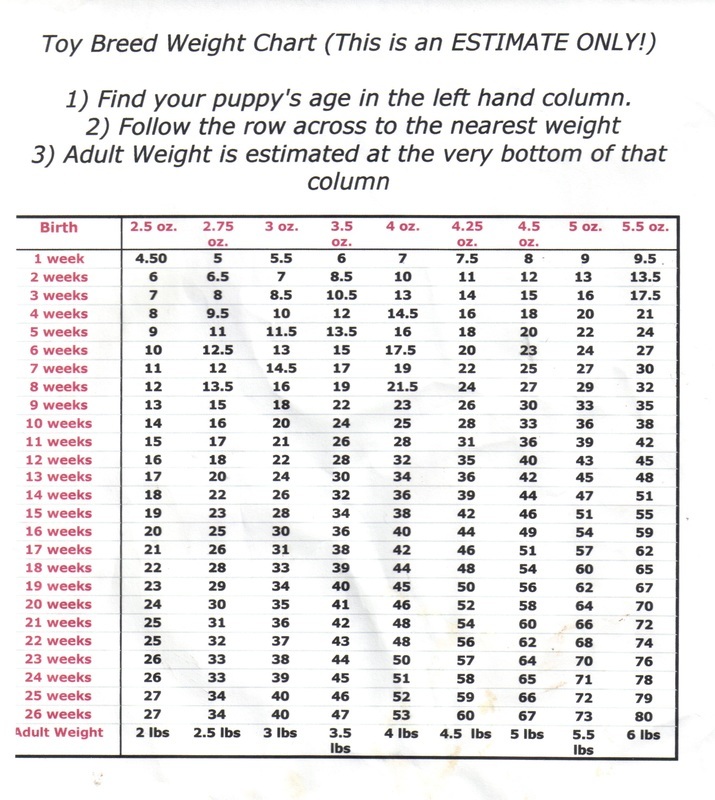 amount throughout the day, to keep your puppies sugar level at a stable level. and therefore you need to really drill in your training as frequently as possible. training is all about repetition and certainly you need to make sure that you always give your dog a treat after every positive step they take when you are in the training phase. The third tip with Yorkshire terrier training think about will be that you should always be maintaining a fairly firm tone when you are reprimanding your dog. If ever your dog does something that is completely unacceptable during your Yorkshire terrier training sessions it is absolutely crucial that you let them know. Using a firmer voice will cause the dog to know exactly who is boss and they will know not to take the same course of action again. The fourth tip to consider is to make sure that you allow your dog plenty of playtime between every single training session they have. If your dog is allowed to stretch their legs and have a little fun then they are far more likely to learn quickly and take up your commands in a much more efficient way. Therefore you should try to create a schedule whereby you will allow your dog some playtime after each training session. absolutely crucial that there are no additional distractions that will compromise the effectiveness of any of the training you are giving. As mentioned, in Yorkshire terriers training they have a very short attention span and therefore anything that distracts them can really compromise your training. remember or not. If they don't, then make sure you pick up that training again in the next session. Finally, always make sure that you use exactly the same command phrases for each individual command. If you want to your dog to do something like sit, then only use the word sit. If you confuse them by using different types of words and phrases and commands then there learning will certainly be stunted and this is not what you are trying to achieve. When all is said and done Yorkshire terriers training should be something that you both enjoy. If you are not enjoying the training sessions then the sessions will not actually be very effective and it is therefore very important for you to make sure that you are both having a good time while the training is being done. All in all, however, if you follow some of these tips then training your Yorkshire terrier should be a relatively quick and rewarding experience. your hair everyday, so will you have to comb your dog. baths and regular hair cuts. many snarls you will still find. bandage on hand just in case the nails do breed. your Vet. Every 12 – 18 months. Get all the materials needed. conditioner and water mix. You can make this at home, or buy waterless shampoo. steps as the comb. Also, brush her face and muzzle very gently. pluck the hair inside the ear. Be careful so that you do not hurt your dog. wipe were the solution stayed. Your dog's ears should be very clean. Take your dog's toothbrush and dog toothpaste. and can prevent painful and costly dental surgeries. nails is essential in the grooming process! conditioner is Crazy Dog or Buddy Wash, these work great on Yorkies. your Yorkie completely starting from the top of the head to the end of the tail. your hands. Start to lather from the top of the neck to the end of the tail. least 3 minutes, making sure you get every single bit of soap out of the coat. keep rinsing until the coat is clean or your dog will be very uncomfortable. Let your dog shake the water off once. Half the drying is done right there. as before, except pay special attention to the featherings, ears, and tail. Comb these so the are straight. so that it stays straight. also cause thinner hair, and the dreaded split ends! still do this, but make sure not to cut too much.